We know professionals tend to operate with some notion of a work week and a schedule. Some may work a fixed schedule (e.g. 9-5), while others may be on call 24/7. Then there are some who may have a much more flexible schedule. Appointments 24/7: Appointment requests can be made at any time of the day, but only can be requested for hours when your office is open (if appointments are enabled). Auto-availability: Your "Call Now" status automatically changes once your office opens AND closes (again, if you've enabled the feature). Customer clarity: Office Hours are displayed on your listing details page which communicates to customers your general availability. Over-ride capabilities: Working late? In early? Have free time on your hands to serve your customers? You can manually override your office hours by changing your status to "Call Now" from the Advisor Dashboard (aka My Account). Office Hours provide you the benefit of a fixed schedule with the luxury of complete flexibility especially when combined with our robust availability and communication tools. How do I set up my Office Hours? Office Hours is replacing the "scheduling feature" which greatly simplifies functionality. You can create set blocks of time when you're generally available (i.e. Office Hours,) with simple added controls to manage your communication preferences during those times to automatically change based on your configurations. We also provide you controls to manage your communication preferences outside your Office Hours (more details directly below). What if I prefer to not have fixed office hours? Set your Office Hours to be open 24 hours (12:00AM to 11:59PM), every day and manually switch your call now availability from the Advisor Dashboard. 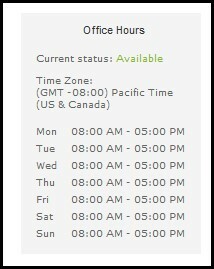 Do not create office hours at all and manually switch your call now availability on and off. Clients and potential customers like to know when they can reach you, so Office Hours provide a descriptive and practical alternative to our previous scheduling feature. If you choose not to create office hours, your listing details page will display that you're generally "closed" however your current availability status will always display regardless of your Office Hours settings. How will customers know what my Office Hours are? Your Office Hours are displayed below your communication buttons on the right side of the page. The default display is Monday to Friday, 8am to 5pm (closed Saturday and Sunday) if you haven't already created Office Hours (or had a schedule previously). If a customer is not logged in, the time zone will display as Pacific Time (system default). If a customer is logged in, your hours will display in their time zone. 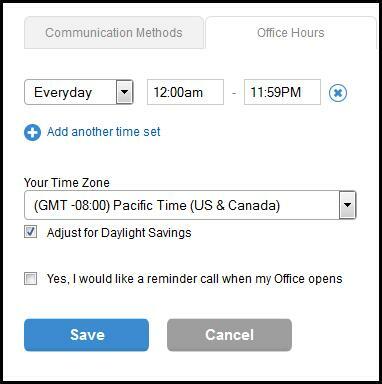 Because "Call Now" functionality can work independently of Office Hours, availability state is also displayed in the Office Hours module. This eliminates doubt or confusion for consumers if they can/want to converse with you when you are accepting calls outside of Office Hours.